KTM has been confirmed as the Major Sponsor for Round 4 of the 2018 Australian Supercross Championship, following the recent announcement that Troy Bayliss Events will host the round at Gillman Speedway in Port Adelaide on October 20. Troy Bayliss says support for the event has been extremely positive, sponsors within and outside the industry have confirmed partnerships and fans are showing support with ticket sales for both Round 4, as well as the third round at GMHBA Stadium in Geelong on October 13. "The motorcycle industry is really embracing the events, Yamaha was confirmed as the Major Sponsor to Geelong Round 3 and I am pleased to announce KTM as the Major Sponsor for Port Adelaide Round 4," Bayliss said. KTM Australia General Manager - Jeff Leisk said that KTM were proud to be the official partner of the Port Adelaide round, and after a long and successful history in Supercross were excited to be able to illustrate this in their own backyard. "At KTM our research and development takes place on the racetrack, and our success on a global scale has paved the way for the technology and performance that has been incorporated into our new generation MY 19 model range." "We look forward to being able to showcase our new generation MY19 models in conjunction with our KTM Supercross Race Team and KTM Supercross Riders, to the city of Port Adelaide and throughout Australia over the course of the Australian Supercross Championship," said Leisk. Bayliss also believes the events can't happen without the support from partners and is excited to see brands like ARB 4x4 Products come on board and support both rounds 3 & 4 of the Championship. "ARB are such a fitting partner, a huge percentage of dirt bike riders own 4wd's to tow and carry dirt bikes to trails and tracks all over the country, and having quality aftermarket products on your four-wheel drive is just as important as having aftermarket parts on your bike, be it for performance or functionality," Bayliss added. ARB Brand Marketing Manager - Mark Berger believes it is the perfect partnership, with most of their customers and staff avid dirt bike riders and spectators of the Motocross and Supercross series. "It's great to be involved in both Round 3 & 4 of this year's Australian Supercross Championship, we're looking forward to seeing some great racing which will no doubt inspire us to get back out on the tracks ourselves," Berger said. The sport is abuzz as momentum continues to grow and gain support not only from within the motorcycle industry but from fans and the wider community. Additional partners already confirmed for Round 3 & 4 include Shannons Insurance, Motorex Oils and Lubricants, Honda Motorcycles, Unit Clothing, Husqvarna Motorcycles, Moto Expo Melbourne, Bikesales.com.au. All sponsorship partners will have displays at each round so fans are able to get up close and understand the products and services they offer. Rumours are high after this past weekend round of the MX Nationals in Conondale Queensland, with strong talks within the pits indicating Geelong, Port Adelaide along with Sydney, Jimboomba and Coolum making up the 2018 Australian Supercross Championships series may see a host of American based riders, to join already confirmed American Justin Brayton on all grids chasing this year's championship title. Ticket sales for each event have been strong with Geelong having the opportunity to host 36,000 fans. Victorian fans pleaded for a Stadium event so now its been delivered its up to the people to support it so we can continue to see Supercross in stadiums in the future. Port Adelaide's Gillman Speedway will be packed with a capacity crowd of 5000 fans up close to the action. Over 25% of capacity is already sold out so don't wait too long if you intend to attend. ARB 4x4 Products will partner with both rounds 3 & 4 of the 2018 Australian Supercross Championship. 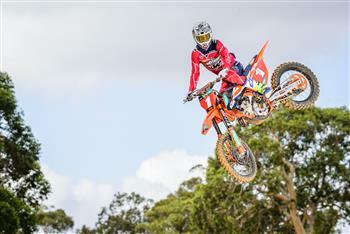 KTM Racing Team rider Egan Mastin flying high, as KTM is named Major Sponsor of Round 4 of the Australian Supercross Championship.